In an effort to stay one step ahead of the competition Hiram Patterson, a media and software mogul, develops a remote viewing wormhole device dubbed the WormCam that allows his media outlets to get the jump on news stories around the world. The WormCam is soon discovered to have other uses including looking into the depths of space and into our own past. The ramifications of such a technology begin to have a profound impact not only on the world at large, but on Hiram and his immediate family as well. A truly inspired concept, The Light of Other Days proposes a technology with far reaching social implications that virtually turns our private lives inside out. First the development of the WormCam allows the media has access to private areas never before imagined. Taking invasion of privacy to new heights, private conversations can be overheard, private moments observed without the person's knowledge or permission. As the technology takes on new dimensions and the past is opened up to remote viewing, every moment of anyone's life is subject to intense scrutiny. The challenge of trying to explore the implications of such a far-reaching technology within the confines of a fictional narrative is that it threatens to overwhelm the human characters of the story. While reading the novel I often felt frustrated with the characters' development and their relationship to the technology, but in retrospect I realize what an extraordinary effort was required by Clarke and Baxter to tell the story of this technology. By means of parallel, imagine for a moment trying to tell the history of such a technology as the telephone or the automobile with just handful of characters and a single plot line. I think it would be virtually impossible to encompass all the social implications of the telephone from its inception to our current use of cell phones in such a context. 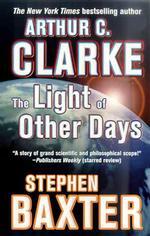 Baxter and Clarke deserve much praise for rising to the challenge of writing such a complex novel. While the science and technology at the heart of the novel is fascinating and believable, the main characters of the story come off much less favourably. Hiram Patterson and his OurWorld empire is a thinly veiled allusion to Bill Gates and Microsoft. Patterson's machinations and his devil-may-care attitude fell flat for me, coming across more as a soap opera like villain only lacking the moustache twisting and maniacal laughter. Hiram's son Bobby Patterson also lacks any real depth and while his two-dimensional personality is partially explained away later in the novel, it's too late to salvage him as a sympathetic character for the reader to relate to. One of the few characters that I did find accessible was Kate Manzoni, an investigative reporter that ties the various elements of the story together. Unfortunately Kate's character is virtually wasted towards the final third of the novel as she has served her purpose in the narrative and the climax of the technology takes centre stage. One of the other troubling aspects of the novel for me was the red herring of the Wormwood comet that is trotted out at the beginning of the novel. We learn early on that Kate Mazoni's claim to fame as an investigative reporter is breaking the story of a government cover-up relating to an impending collision with the Wormwood. Granted its arrival is a distant 500 years, but the unavoidable Armageddon has already had far reaching impacts on Earth. The looming prospect of the end of life on Earth at the hands of the asteroid is mentioned on several occasions and the reader is lead to infer that the WormCam technology may be used to resolve this dilemma before the end of the novel. I don't know if this can be considered a spoiler, but the entire wormwood dilemma is dismissed in the final three pages of the book with one sentence. "The Wormwood? You mean the comet. We pushed that away long ago." She said it casually, as if a moth had been brushed aside. Arggh! Why trot the damn thing out in the first place and dangle it before the audience if it was just a distraction. In my opinion the novel wouldn't suffer without reference to it. Whehter it was initially intended as a bigger plot element, but was discarded as the book wound down only the authors and perhaps their editor could answer that. More frustrating is the final chapter that ends abruptly and the tacked on epilogue that seems desperate for closure. Both elements weakened the overall impact for of the story for me. As part of the afterword the authors cite a number fictional and non-fictional works about the nature of wormholes and viewing the past. An entertaining read for some great concepts, but unfortunately I predict the characters will fade from memory soon after putting the book down. A service offered by Google - Google Print allows you to search books online and view either excerpts or entire text depending on copyright and arrangments worked out with publishers. This appears to be the first three pages of the novel Light of Other Days. It also allows you to search within the story for keywords. How many SF authors have a FOUNDATION named after them? Sir Arthur C. Clarke's scientific legacy and imagination has inspired the foundation to strive for the synthesis of science, literature and social concern that is reflected in the author's work. The site contains an overview of projects undertaken by the foundation as well as a biography and essays by Arthur C. Clarke. A Stephen Baxter fan site maintained by Simon Bradshaw that has a good overview of the author and his work. Unfortunately the site was last updated in 2002 by the looks of it.